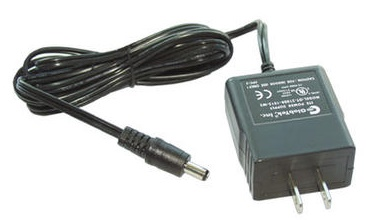 The 15966 is a charger used with the SC532A, RF401-series radios, RF407 radio, RF412 radio, RF422 radio, RF427 radio, RF450 radio, or MD485 (typically used at the PC where ac power is available). The 15966 wall charger can power many devices including our spread spectrum radios, a SC532A interface, and MD485 multidrop modem. This wall charger is typically used at the PC site where ac power is available. Its cable is fitted with a barrel plug that connects to the device.